George Bernard Shaw once wrote about the virtues of being “thoroughly worn out before you are thrown on the scrap heap.” Phil Tagami, the developer of the Fox Theater and the Rotunda Building, not only posts these words on his Web site, he lives them. In an animated interview in which we never sat down, Tagami wasted no time revealing what drives him. What is your favorite piece of the Fox Theater renovation? All the things that still aren’t done. Until it’s completed, until the endowment is fully raised—until everything on our checklist is handled and the building is really dialed in and we really have a good understanding of how to best provide an event space that meets today’s standards, respects the preservation of the historic fabric and is also economically sustainable so the city doesn’t have to have any fear of supporting it, the job’s not done. I read that Jerry Brown is your mentor. Without question, I would say he is one of them. There are a lot of mentors that I have who demonstrate their greatness through the eloquence of their work, be they craftspeople or construction people. But politically, Jerry is definitely a mentor. His Jesuit education and his form of instruction are much different than the typical relationship you’d have with somebody. I would say Jerry is intellectually honest, raises a lot of good questions and is even willing to argue both sides to demonstrate his mental flexibility and his understanding of issues. It sounds as though spirituality plays a strong part in your sense of self. I was raised Episcopalian and have done a lot of reading about Buddhism but am a practicing Christian. It really boils down to your good works and your faith. It’s been said that Oakland has an identity crisis. How do you see the city you’ve lived in most of your life? I’ve had a challenge with that. For years, colleagues and friends and outsiders have made an analogy that Oakland was on its way. I’ve always thought that Oakland was here and that Oakland was what it was. This is the port city of Oakland. It’s a great city because it chooses, through its gritty determination and hard work, to do what other cities can’t—by way of geography, its vision and its message. We’re an incredibly diverse community that some say sits in the shadow of San Francisco. I would rather say we have a great view of San Francisco and they have to look back at us. 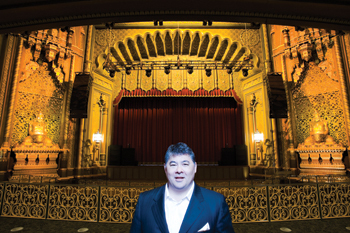 How important is the restoration of the Fox Theater and other architectural gems to the rebirth of Oakland’s struggling neighborhoods? A room full of healthy, happy people who are peacefully congregating is probably the most enlightening and elevating experience you can have, so the more you can cultivate healthy communities—people who are well fed, people who have good jobs, people who are in healthy relationships, people who have love—that’s more powerful than any brick or building or piece of glass or piece of steel. But there’s no question that things like the Fox Theater, things like the Rotunda Building, can amplify that healthy community. What about your next project—the historic West Oakland train station? That’s going to be a very difficult project. It will take many years and it’ll be more expensive than we think it’s going to be. We know all these things going into it, but it must be done. That building symbolizes an arrival for many people’s families into Oakland. It was Oakland’s Ellis Island. It was the terminus where a lot of people got off to find jobs and employment and a new life and a more tolerant society. I get the sense you never relax. Tell me I’m wrong. I’ll take that as a friendly rebuke. Yes, there are breakfasts at the Egg Shop where the Blackberry is humming and we have to respond to the crisis of the moment. But I do have a lot of quiet time and down time where people will even say “Phil talks a lot. Does he talk at home?” My wife laughs because I might not say a whole heck of a lot at home. But seriously, how do you juggle work with your family life? I value and treasure my time with my family among all things, and it’s always a difficult decision when we embark on these projects—how it’s going to impact our family lives. I don’t want to lose my health or my family in the process of my pursuits, so I think we evaluate that daily. And your ultimate wind down?